TOOLING AND WORKHOLDING Modern Machine Shop 123 WE ARE... THE FASTEST GROWING TOOL MANUFACTURER IN THE WORLD! 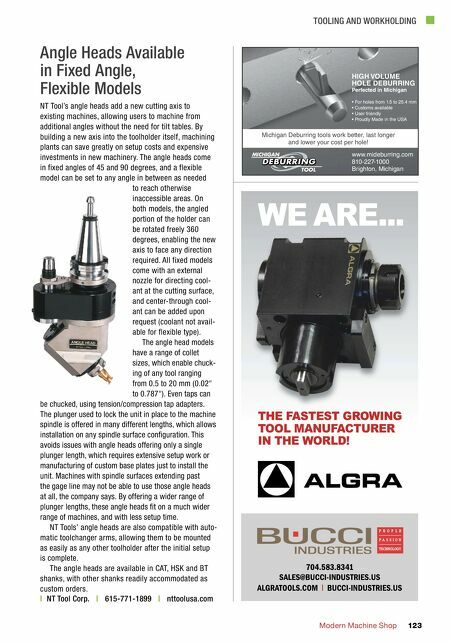 704.583.8341 SALES@BUCCI-INDUSTRIES.US ALGRATOOLS.COM I BUCCI-INDUSTRIES.US NT Tool's angle heads add a new cutting axis to existing machines, allowing users to machine from additional angles without the need for tilt tables. By building a new axis into the toolholder itself, machining plants can save greatly on setup costs and expensive investments in new machinery. The angle heads come in fixed angles of 45 and 90 degrees, and a flexible model can be set to any angle in between as needed to reach otherwise inaccessible areas. On both models, the angled portion of the holder can be rotated freely 360 degrees, enabling the new axis to face any direction required. All fixed models come with an external nozzle for directing cool- ant at the cutting surface, and center-through cool- ant can be added upon request (coolant not avail- able for flexible type). The angle head models have a range of collet sizes, which enable chuck- ing of any tool ranging from 0.5 to 20 mm (0.02" to 0.787"). Even taps can be chucked, using tension/compression tap adapters. The plunger used to lock the unit in place to the machine spindle is offered in many different lengths, which allows installation on any spindle surface configuration. This avoids issues with angle heads offering only a single plunger length, which requires extensive setup work or manufacturing of custom base plates just to install the unit. 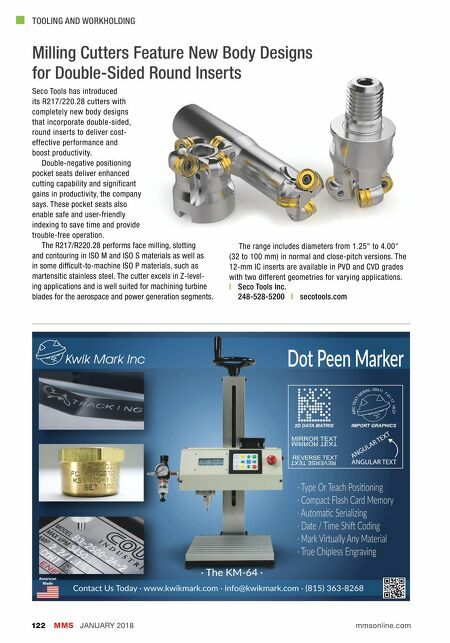 Machines with spindle surfaces extending past the gage line may not be able to use those angle heads at all, the company says. By offering a wider range of plunger lengths, these angle heads fit on a much wider range of machines, and with less setup time. NT Tools' angle heads are also compatible with auto- matic toolchanger arms, allowing them to be mounted as easily as any other toolholder after the initial setup is complete. The angle heads are available in CAT, HSK and BT shanks, with other shanks readily accommodated as custom orders. | NT Tool Corp. | 615-771-1899 | nttoolusa.com Angle Heads Available in Fixed Angle, Flexible Models • For holes from 1.5 to 25.4 mm • Customs available • User friendly • Proudly Made in the USA Michigan Deburring tools work better, last longer and lower your cost per hole! www.mideburring.com 810-227-1000 Brighton, Michigan HIGH VOLUME HOLE DEBURRING Perfected in Michigan 1,, 1,, 1,, /""